Northern New Hampshire is the epitome of Northeastern natural beauty. While attractive any time of the year, late summer and fall are particularly beautiful times to savor the beauty of the White Mountains in New Hampshire. The charming settlement of North Conway is an excellent base for visitors without cars to explore Mt Washington Valley and the White Mountain National Forest. In addition to being compact, very walkable, and easy to reach from Boston by bus, North Conway Village is home to both natural attractions and tax-free shopping. Sites of interest not within walking distance can be reached using Fast Taxi, a local taxi company in North Conway. For these reasons, our August Car Free Journey column spotlights North Conway, New Hampshire. Mt Washington Valley is a collection of 27 towns and villages all surrounding Mount Washington, the tallest mountain peak in the North East. The geographic center of Mt Washington Valley, is North Conway, NH. The entire valley is surrounded by the 660,000 acre White Mountain National Forest, offering seemingly endless hiking, biking, rock/ice climbing, waterfall viewing opportunities and scenic beauty. During each season this region offers gorgeous vistas and plenty of natural and man-made recreation. The region also offers 10 golf courses, adventure and water parks, the Conway Scenic Railroad, and 200 tax-free outlets, shops, boutiques and stores. There is no sales tax in New Hampshire (there is, however, a 9% rooms and meals tax). North Conway is a year-round resort area in eastern Carroll County, New Hampshire, with a population of 2,349 (2010 U.S. Census). North Conway is the largest village within the town of Conway, which is bounded on the east by the Maine state line and the White Mountain National Forest on the west and north. Conway is home to Cathedral Ledge (popular with climbers), Echo Lake State Park, and Cranmore Mountain Resort. Chartered in 1765 by Colonial Governor Benning Wentworth, the town is named for Henry Seymour Conway: ambitious son of a prominent English family, who was elected to the House of Commons at age twenty, fought at Culloden, and became Secretary of State. The White Mountains became a popular destination for artists in the 19th century. Their paintings, known collectively as White Mountain Art, attracted tourists to the area, particularly after the Portsmouth, Great Falls & Conway Railroad extended service here in 1872. In 1932, “snow trains” began carrying enthusiasts to the area. However, by the 1950s increasing automobile travel brought the decline of trains. The railroad abandoned passenger service to the area in 1961, and freight service in 1972. In 1974, the Conway Scenic Railroad was established. It offers visitors a tour of the region, including Crawford Notch. Its Victorian station is on the National Register of Historic Places since 1979. North Conway and its surrounding towns offer stupendous hiking in the White Mountain National Forest. The area, particularly Cathedral Ledge in Echo Lake State Park, is a major rock climbing destination. The 500-foot (150 m) cliff overlooks Echo Lake and North Conway from the west. Visitors without cars can call Fast Taxi to drive them to the Cathedral Ledge summit to enjoy the fine views of the Saco River Valley. Come here to the White Mountains to enjoy autumn colors on the surrounding mountains and forests late September through early October. The Conway Scenic Railroad offers train rides that leave from the village’s Victorian station. In winter, the village is the destination for skiers visiting area resorts such as Cranmore Mountain (located in North Conway), Attitash Mountain Resort, Black Mountain, King Pine, Shawnee Peak and Wildcat Mountain, plus six additional ski resorts. The only way for non-drivers to get to Mt Washington Valley is by bus. Concord Coach (formerly Concord Trailways). The best place to start your trip is in Boston at either Logan International Airport or South Station (a connection from Amtrak trains or Greyhound bus). At the time of this column, there were two daily trips in each direction. The cost is $30 one-way and $56 round trip. (For more details, visit http://www.concordcoachlines.com, or call toll-free 800-639-3317 or the local number: 603-228-3300). Buses leave Logan Airport at 9:25 a.m. and 3:40 p.m., South Station at 10:00 a.m. and 4:15, and arrive in North Conway at 1:35 p.m., and 7:40 p.m. Returning buses leave North Conway at 8:30 a.m. and 2:35 p.m., and arrive at South Station 12:20 p.m. and 6:20 p.m., and Logan International Airport at 12:35 p.m. and 6:35. p.m. The Concord Coach stops at the Eastern Slope Inn in the heart of North Conway Village. (http://www.concordcoachlines.com/index.php/nh/north-conway) From there, all of North Conway Village is easily walkable. Another option is Sutton Luxury Limousine, which will pick you up at any New England airport and take you to North Conway. For details and reservations, visit www.suttonlimos.com, or call 603-387-3663. North Conway is a small village and you can pretty much walk to anywhere here. Taxi services are available to take you throughout North Conway. Fast Taxi delivery and shuttle service will be your best friend. They are reliable, friendly and very knowledgeable about the Mt Washington Valley and can take you anywhere you want to go. Info: www.fasttaxianddeliverysvc.com, or call 603-356-0000. The best bet is to stay in North Conway Village. There are a number of inns and B&Bs in the Village, including the Cranmore Inn, the Kearsarge Inn, Spruce Moose Lodge and the Nereledge Inn. If you want a larger hotel/resort property, stay at the Eastern Slope Inn and Resort. Another option is the Briarcliff Motel. Further down the road, try Hampton Inn and Suites, Comfort Inn North Conway, Green Granite Inn, North Conway Grand or Residence Inn. http://www.mtwashingtonvalley.org/visit/where-to-stay.cfm, or call toll-free: 877-948-6867. For reviews of North Conway accommodations, Trip Advisor is a good resource. You can find their reviews at http://www.tripadvisor.com/Tourism-g46186-North_Conway_New_Hampshire-Vacations.html. North Conway is very walkable. For times when you need a ride to attractions and locations outside the village, Fast Taxi (www.fasttaxianddeliverysvc.com, or call 603-356-0000) is the best transportation resource available. Sutton Limousine provides limousine service when needed (www.suttonlimos.com, or call 603-387-3663). Both road and mountain bikes are available for rent in the village. Any of the three biking shops within walking distance of the Concord Coach bus station can give you information about trails and other places to bike. For more information about renting bikes and where to bike, visit: Joe Jones Sun and Ski Sports (www.joejonessports.com/ or call 603-356-9411), Red Jersey Cyclery (www.redjerseycyclery.com or call 603-356-7520), or Stan & Dan Sports (www.stananddansports.com/ or call 603-356-5997). 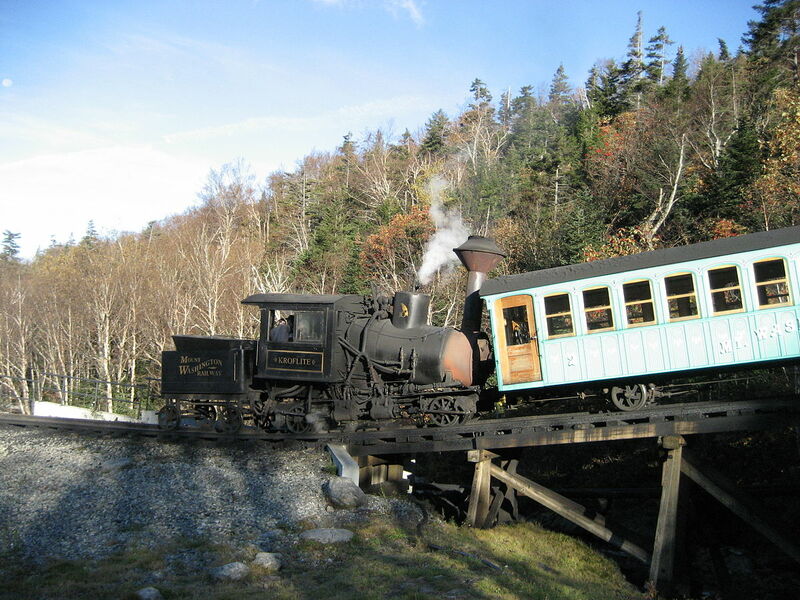 “Mount Washington Cog Railway Start” by Dan Crow – Self-published work by Dan Crow. Licensed under CC BY-SA 3.0 via Wikimedia Commons. Conway Scenic Railroad: scenic train rides and dinner rides: www.conwayscenic.com. Cranmore Adventure Park – www.cranmore.com. Zeb’s General Store – largest collection of New England-made specialty foods in the country: www.zebs.com. The Saco River’s crystal clear waters and wide sandy beaches make for some excellent canoeing and kayaking. Rent canoes, kayaks or tubes and spend your day meandering down the river, then take advantage of shuttle transportation back. Here’s one adventure park with something for everyone. Scenic chairlift rides take you to the top of the mountain where a new trail offers the perfect loop and picnics are more scenic than ever. Cranmore Mountain has plenty of exhilarating fun for the whole family. Take the 6/10 mile hike into this cascading series of pools, waterfalls and natural swimming holes. This is one of the most special places in Mt Washington Valley. Mt Washington Auto Road has guided tours to the top of Mt Washington. On a clear day, see into four states and Canada from the top of Mount Washington. Don’t miss the newly opened Extreme Mount Washington Museum on the summit, chronicling the history of extreme weather on the tallest peak in the Northeast. Storyland- great theme park for children and all. Story Land, celebrating its 60th anniversary, is where fantasy lives! Don’t miss the brand new one-of-a-kind wooden roller coaster Roar-O-Saurus and the new dino-park. Settlers Green Outlet Shopping: This outlet center has over 60 outlets. Here’s the ideal spot for back-to-school shopping. More than 60 tax-free manufacturers outlet stores offer everything from shoes to apparel, kitchenware, specialty foods, books, gadgets and much more. “White Mountains panorama” by Charlie DeTar (Yourcelf (talk)) – Own work. Licensed under CC BY-SA 3.0 via Wikimedia Commons. Mt Washington Valley is world known for its weather. For decades it held the record for the highest winds ever recorded (in April, 1934) atop Mt Washington. The world-famous Mt Washington Observatory is located on the summit of Mt Washington, but it also operates the Weather Discovery Center in the heart of North Conway village. The Weather Discovery Center is the only museum in the country totally dedicated to weather. Whether or not you are a weather buff, this museum, filled with interactive displays and fun experiments, is a must-see. There’s even the opportunity to go into a recreation of the building atop Mt Washington where the highest winds were recorded and see, hear and feel what it was like to be there back in 1934. For more information, visit http://www.mtwashingtonvalley.org/newhampshire/recreation/mount-washington-observatory-weather-discovery-center.cfm. North Conway Golf Course – eat lunch on the deck overlooking the 18th hole and Cathedral ledge beyond. Also, look for the Valley Originals flags (yellow with a fork) outside restaurants. This is a collection of 30+ independently owned restaurants dedicated to community spirit and finest local cuisine. For more details, phone numbers and web sites for these restaurants, visit www.mountwashington.org. 2617 Main St # 1, North Conway, NH. You can reach them via phone at 800-DO-SEE-NH (800-367-3364) or locally at 603-356-5701. Vacation planning concierge and staff are on hand 9-5pm (M-F) to answer questions. Their website offers the perfect resource for planning your lodging, dining, and recreation. Go to www.mtwashingtonvalley.org for complete information. Additionally, the Information booth managed by the Mt Washington Valley Chamber of Commerce is a cute yellow building adjacent to the chamber offices and an easy stroll from anywhere in North Conway village. It’s packed with brochures, maps and more plus very knowledgeable and friendly volunteers who will be happy to offer assistance and ideas for those without cars. This entry was posted on Wednesday, July 23rd, 2014 at 10:03 pm and is filed under Car Free Journey. You can follow any responses to this entry through the RSS 2.0 feed. You can leave a response, or trackback from your own site.